Step 2: Fill in the information, then click "Register"
1. The password must contain at least 6 characters: letter & number. Case sensitive and number solely is not allowed. 2. Referral code is optional, which is provided by ESSA's staff. Step 3: CIlick the the link in your email, it will jump to the page for verification. 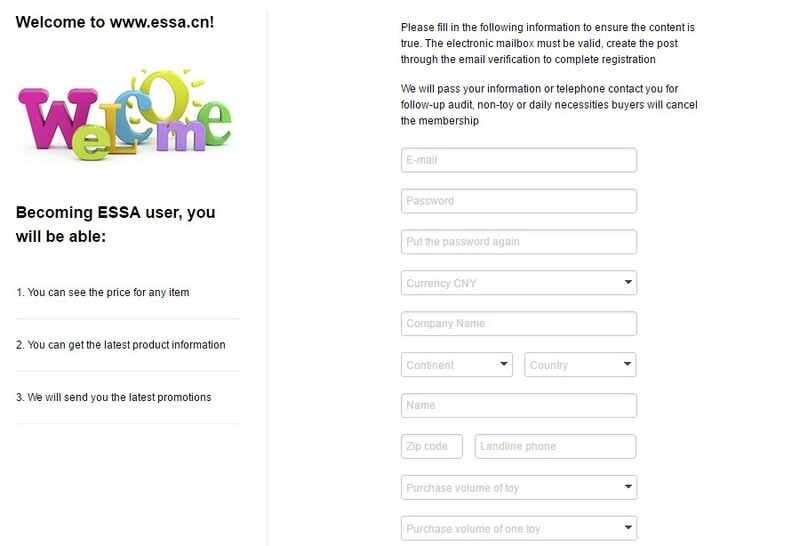 1.E-mail and phone must be in use as our customer assistants will contact you soon. 2. Please remember your account and password. 2. If there are several users in my company, what to do? You can create corporate account for several employees. Orders in corporate account are independent from each other. The transaction process involves many matters and takes a certain amounts of time. To save your communication cost, ESSA's rich experience in the industry will assist you in the process. You can contact your Sales Consultant during product selection, processing orders if any problems appear. After registration you can choose your own sales consultant according to your needs, if not, we will provide the consultant automatically.